My ZaggSparq has just failed to charge or even work, I have checked with many of my friends who have reported the same problem. I Do Not Recommend Buying The ZaggSparq. Zagg is a company known for their legendary invisibleSHIELD, which helps protects any mobile and GPS devices from scratches, bought many of their shields in the past (they are that good), till one day I got an email from them announcing ZAGG Sparq. The news got me excited. Personally, it will solve a great issue I have with powering all my gadgets on the go. Since I am always searching for such a power solution for my ever-hungry iPhone(s), iPod, and other gadgets. I tried different solutions, like carrying a charging cable and power-brick (not very convenient), I have also tried a small faulty battery pack called Kensington Mini Battery Pack, It worked fine for a couple of weeks, soon after it started to lose power capacity. Plus due to its bad design, you will find yourself with a cold black brick dangling out of your iPhone which adds a lot of mass while traveling with the device. Plus it feels like it’s going to get snapped off if you mistakenly hit something (don’t try this at home or anywhere else). I then started to think of getting the Mophie Juice Pack or Juice Pack air, yet I didn’t find great reviews about both products, plus if Apple decides to change the physical shape of the next iPhone, you can kiss those packs good bye. Another down-side to the juice packs is the fact that they work with a specific device, so you can’t plug an iPod to it (without looking odd). 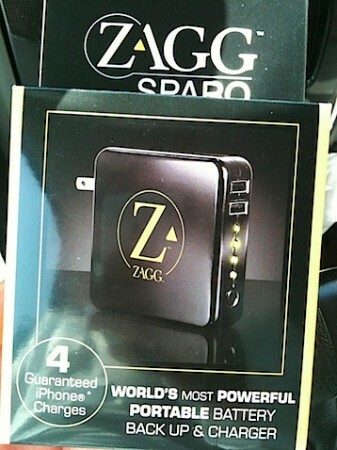 Enter ZAGG Sparq, when I first saw this I thought that this has the potential to be what I am looking for in a battery pack. – I don’t want the pack to restrict me to charge only one type of device because of its design. – I want the pack to give me more then one charge. – I would like a pack that can charge multiple devices at once. Out of the box the Sparq looks like Apple’s power brick designed by Darth Vader, it has the same shape as the power brick, yet a bit larger, and it comes in glossy black (hence the Darth Vader connection). I read that that would be an issue since it can show all the fingerprints on it, but thinking practically, a battery pack isn’t something you will be flashing around anyway. The unit has two (2) USB ports, which means you can charge any two USB powered devices at once. The Sparq offers 6,000 mAh Lithium Polymer battery which has the power to charge an iPhone up to four times. It has 4 yellow lights indicate power level. So with the USB approach, you can plug in your iPhone, iPod, BlackBerry, Bluetooth headset, digital video camera, or any power hungry device that charges over USB. I tried it on a flight and it was a charm, I got to watch a movie on my iPhone, then listen to a podcast, and once I was back on the ground I had a full battery ready to go. Now here are some of the things I didn’t like about the Zagg Sparq and I hope the company will conceder an upgrade to it soon to address those issues. When you plug the Sparq to charge you won’t find any indicators to tell you whether it is charging or not, the four yellow lights should be used in such a situation, furthermore, you won’t know when the pack is fully charged and ready to go. The only way to check on that is to click on the charge indicator button to see how far it charged. Another thing to keep in mind is that the leaflet that came with the device recommends that you charge the Sparq for 9 hours to get a full charge. I never checked if the unit would charge in less then 9 hours, but for a unit that gives you 4 full iPhone charges, plugging it over night won’t be an issue in most cases. So if you’re always on the go, or travel a lot, Zagg Sparq makes it feel like you have a chunk of your wall’s power outlet with you all the time. 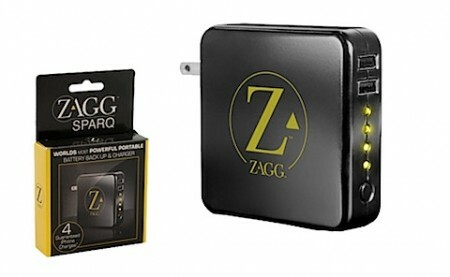 The ZAGG Sparq sells originally for about $129.99, but you can get it on their site for $99.99. Originally posted on Mazen’s site. Next: Having Problems with iPhone Push feature? this could solve most of us iphone battery issue i hope. when it will be available in saudi arabia? I told itechia about it and they are interested in it. The ZAGGsparq 2.0 is out to fix these problems. You can call ZAGG to get a free swap. This was just posted on facebook.com/iphone4. ZAGG sent all ZAGGsparq owners notification that they would replace your v1 unit with the updated v2 unit. Did you take them up on that offer? Not only did I not have any problems with my v1, but the new v2 is workinh excellently for me.